BUMBLE-Box is a fun filled “White Collar” Boxing Fundraising Event taking place in Dandelion this Thursday evening 13th November at 8pm, with all funds going to BUMBLEance, the children’s ambulance service. The BUMBLE-box Fight Night will bring the glitz and glamour of Las Vegas to Dublin ensuring that the 600 person plus sell out event will be entertained with a ‘knockout’ time, while raising much needed funds for the BUMBLEance. 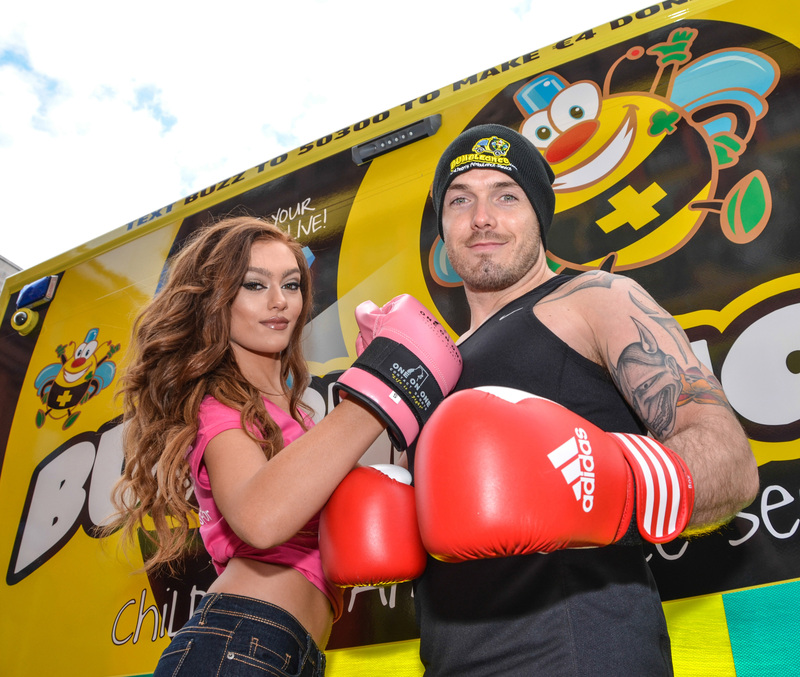 This sponsored Bumble Box has been organised to fund the BUMBLEance service by Angela O’Connor of Train-Ability and one of the boxing volunteers Darren Moore, General Manager of the Church Venue in Dublin’s City. “BUMBLEance is an amazing charity servicing all families throughout Ireland and we are delighted to help such a worthy cause” said Darren Moore. In total 30 volunteer fundraisers like former 98fm Radio presenter Teena Gates will jump into the ring, providing each individual the opportunity to face their fears, focus their mind and boost their personal confidence. Walking into that ring for this great charity will be very rewarding. Celebrity judges on the night will be Aidan Cooney TV3 & Johnny Lyons 98fm and others. “Everyone has trained very hard, it’s been very tough but the guys and girls have all supported each other and are looking forward to stepping into the ring on Thursday night” said Darren. “BUMBLEance” is the World’s first interactive children’s ambulance service which transports children for free, from all over Ireland to and from the main children’s hospitals, respite and treatment centres and hospices. One of the charity’s most valuable service is the Angel Trip, a child’s final journey on earth home before they grow their Angel Wings. BUMBLEance is the brain child of Tony and Mary Heffernan who sadly lost both their daughter Saoirse (5) in 2011 and their son Liam, also 5 to Battens Disease, just six months ago in May 2014. Liam had his Angel Trip on-board BUMBLEance. Knowing first-hand the challenges and fears that a normal ambulance can create in a child’s mind with their late daughter Saoirse, BUMBLEance was purpose built and launched in September 2013 to remove the stress of ambulance trips for children and their parents. The charity receives no state funding and relies totally on fundraising and financial support from the public & business community to operate this priceless service. BumbleBox is a White Collar Boxing Event being Held in Dandelion, Dublin 2 on Thursday 13th of November 2014 at 8pm Doors open 7.30pm. For Editor & Photo/ News Desk: All money raised is going to BUMBLEance. Event organisers Angela O’Connor and Darren Moore & Tony Heffernan from BUMBLEance will be there for interviews. There will be colourful images, mascots and characters there on the night. BUMBLEance will also be there on the night to get a great photo. Notes To Editor: Mr. Heffernan, as CEO of this National Children’s Charity, Saoirse Foundation has not received a salary, bonus top up or any pension for running the organisation since it was founded in March 2010. Thirty volunteers and fundraisers are boxing for sick children in Dandellion this Thursday evening 13th November to raise much needed funds for the BUMBLEance, part of The Saoirse Foundation.